As a leading technology developer and manufacturer of cloud-based Internet of Things (IoT) solutions for the HVACR industry, PaceControls has relied on a model based development (MBD) process to develop its energy saving algorithms since 2011. PaceControls’ third generation product, an Android-based, 4G LTE/Wi-Fi/ZigBee wireless energy and smart grid product suite, named PACE+PACE Cloud, was designed, tested, and produced using Embed. The PaceControls technology, residing between the thermostat and the HVACR equipment, accepts the thermostat control signal and other signals to produce optimized control signals that minimize energy usage of the HVACR equipment. Additionally, a real-time estimate of energy savings are calculated and communicated to the cloud and customers using the Verizon LTE network. In large commercial installations, networks of Packaged Roof top Units (RTU) provide the heating and cooling. PACE Nodes are installed on each RTU and communicate with one another over a ZigBee network. As with most high volume commercial control products, OTA firmware updating is also supported. HVACR systems come in many configurations and sizes, ranging from single compressor/single fan to multi compressor/multi fan units. The PaceControls technology must be flexible enough to accommodate 10 major HVACR configurations, each with over 200 individual requirements. In addition to quality, cost, and schedule, other challenges include: managing requirements and algorithmic complexity, ease of installation and use, accurate estimation of savings, and more. Relying on Embed combined with the MBD process, PaceControls has successfully developed and deployed two generations of PACE+PACE Cloud over a four year period with zero significant defects. MBD is a process that consists of simulation and Hardware in the Loop (HIL) testing, and Embed fully supports all steps in the process. 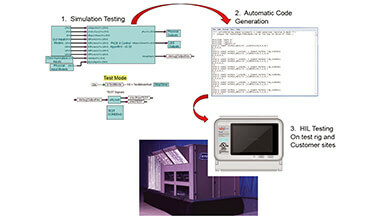 During the simulation step, the system requirements are represented by design models. Design models are dynamic block diagram and/or state machine models that display the requirement and the acceptable deviation as a time history signal with maximum and minimum boundary signals. Design models are linked to their requirements using Embed Hyperlinks which are embedded in the models. Next, dynamic models of the HVACR systems (aka plant models) are created followed by the design, analysis, and modeling of the energy and demand optimization control algoritms. The combined “controls + plant” model goes through an iterative “analysis + redesign + simulation” process until its performance lies within the acceptable range for each of the design models. 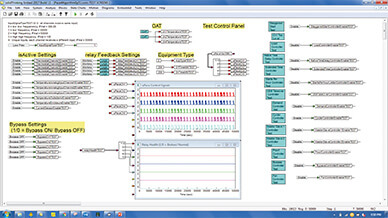 Embed block diagrams and state charts, the analysis toolbox, filtering, and optimization functions are used extensively during the simulation step. During the HIL testing step, Embed automatically generates C code for the controller model. The code is then compiled with Embed support libraries as an Android application where it executes on the PACE Node utilizing a cloud-connected Qualcomm Snapdragon microcontroller. The product is then tested in a desktop setting to ensure sensor scaling, latency, order of execution, initialization, CPU utilization, and accuracy are being calculated correctly. In the desktop setting the plant is replaced by a general purpose I/O board controlled by an Embed model producing test signals for sensors and recording actuator signals from the microcontroller. Once desktop testing is complete, the PACE Node system is connected to an actual HVACR system and performance is re-evaluated subject to the design models. Using Embed, PaceControls has designed and delivered two generations of quality energy industry-leading smart grid solutions. With over 19,000 installations, not one significant defect has been reported. Embed fully supports the key elements of the MBD process including requirement capture, control system analysis and design, filtering, optimization, simulation testing, automatic code generation, and HIL testing. The latest PaceControls suite, consisting of over 15,000 Embed blocks, generated over 20,000 lines of code and satisfied over 2,000 requirements. Concept to product development time was 1.5 years with an FTE development team of four engineers. The verification process answers the question “did we build it right”. PaceControls, located in Philadelphia Navy Yard’s Clean Energy Campus, is a leading technology developer and manufacturer of cloud-based IoT smart grid solutions for the Heating, Ventilating, Air Conditioning, and Refrigeration (HVACR) industry. With a product line that spans three generations, there are over 19,000 installations worldwide providing customers with 15%+ savings on their electric and gas energy usage.